For preventing fatigue and weakening of the immune system caused by intense exercise. Increasing muscle mass is a well-researched area in the domain of competitive sport and endurance, but muscle mass is also important for older people at risk of cachexia, or younger, overweight individuals who want to get the most out of a moderate exercise programme..
¤ Beta-ecdysterone (or 20-hydroxyecdysone) is an active principle found in Rhaponticum carthamoides, Suma and Cyanotis vaga. The majority of ecdysterone studies to date have been conducted in Eastern Europe and Russia. They conclude that its effects are comparable to those of a mild anabolic or androgenic drug - it has a stereochemical analogue structure but without any of the unpleasant side effects. Due to its very high cost and the relatively large amounts needed (one gram per day), beta-ecdysterone is found in some of the most doctored and fake products on the market. The excellent quality of the extract sold by Supersmart is, of course, guaranteed. ¤ Human and animal studies have shown reproducible results in terms of muscle strength and gain. The Russian studies have been replicated at the Centre for Biotechnology in New Jersey. 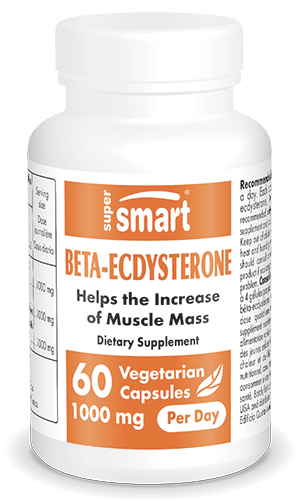 Tested on human muscle cells, beta-ecdysterone was shown to increase protein synthesis by 20%. It also produced improvements in insulin function resulting in an appreciable reduction in fat mass. - increasing muscle mass and the ratio of lean muscle to fat. A recent study of 80 athletes showed a gain of 6 to 7% in muscle mass and a 9 to 10% loss in fat mass after only two weeks' supplementation. - increasing sperm motility, and enhancing testosterone production and metabolism, but without any androgenic side effects.